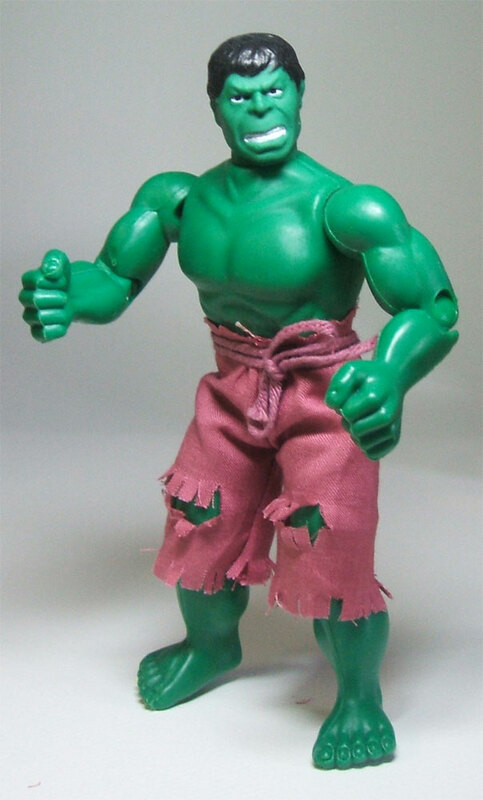 The Mego Hulk stands slightly under eight inches tall due to the short, squat legs on this body type Mego developed for the Hulk and the Thing. This size disappoints some folks who want the big green guy to over their other heroes. It’s nonetheless a great Mego with a fine head. 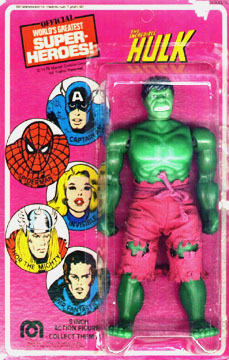 Hulk was Mego’s “late bloomer” a modest seller at the beginning but when the TV series aired, he became part of Mego’s “Big Four” Superheroes. What sort of machine must they have used to produce his pants? 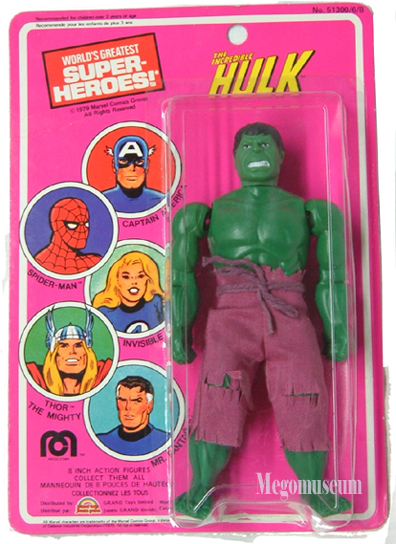 Hulk was a late starter at Mego but he soon became one of the “Big Four” when it came to Superhero merchandising, this picture is just some of the Hulk merchandise Mego created.. 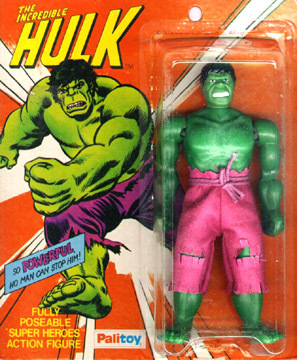 The lesser seen Scowling Face 1975 Mego Card Hulk..
Mego Museum Helpful Hints: Hulk joints are extremely fragile and tend to lose limbs in transit. 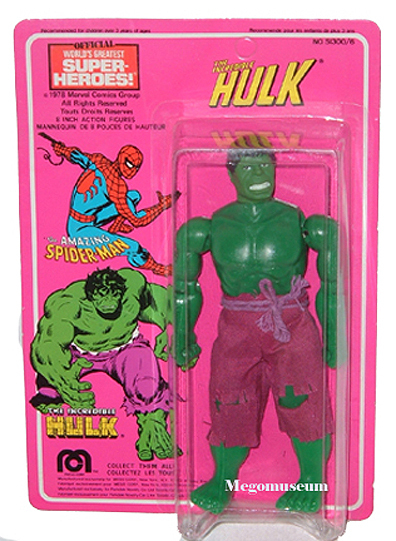 Whether selling or buying be sure to take extra care in transporting a Hulk. 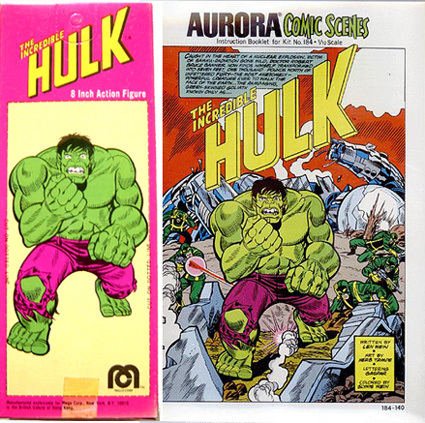 Two examples of Canadian Mego packaging courtesy BrAin . Above is the Parkdale Novelty Canadian Dual Card usually seen with a black line running through it’s address info, Below is Canadian Grand Toys Card, note the fact that both packages feature French and English, not french exclusively. 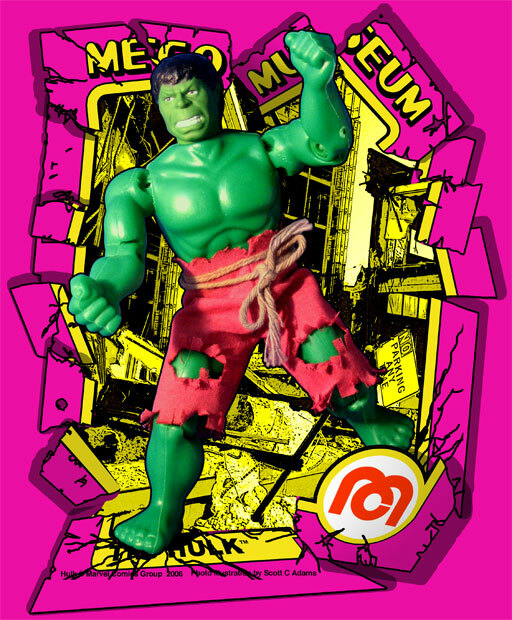 Palitoy UK Mego Hulk card a beautiful piece and the most affordable one available courtesy of Scott Arendsen.